Let me preface this post by saying I am not a quilter. I've made one quilt before, and it was so imprecise and such a confusing thing that I swore I'd never start another quilt. Swore it! And so, a year and a half later, I stared another one, then finished it in probably under 24 total hours. I wanted a thrash quilt, something I wouldn't be worried about. Something we could take to the park or the beach and I wouldn't be concerned about grass stains or spilled juice. Something perfect for little boys. So I didn't measure, I didn't wash the fabric first, I didn't press the seams, and I used multiple colors of thread throughout. 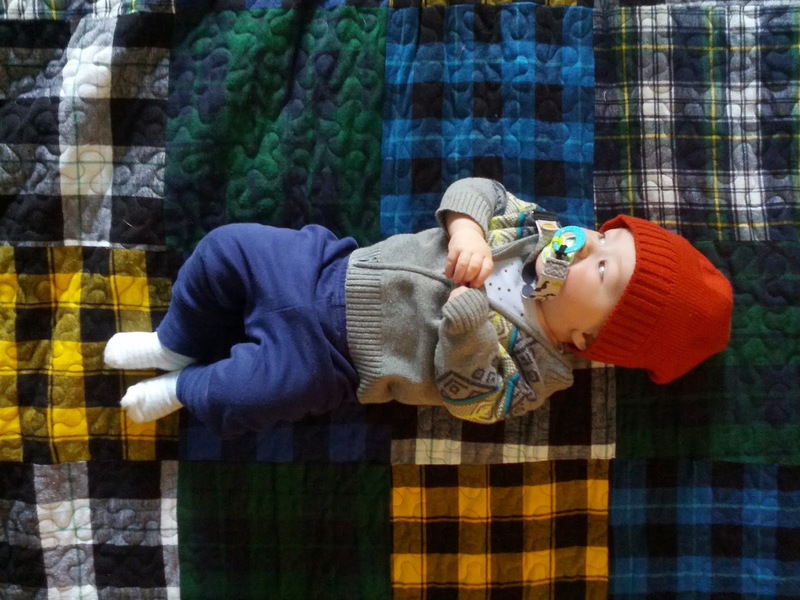 I figured if it's being made to be thrashed, I wasn't going to slave over a perfect, beautiful quilt. It needed to be dark in color, big, and super soft. I bought one yard each of six different types of plaid shirting flannel. 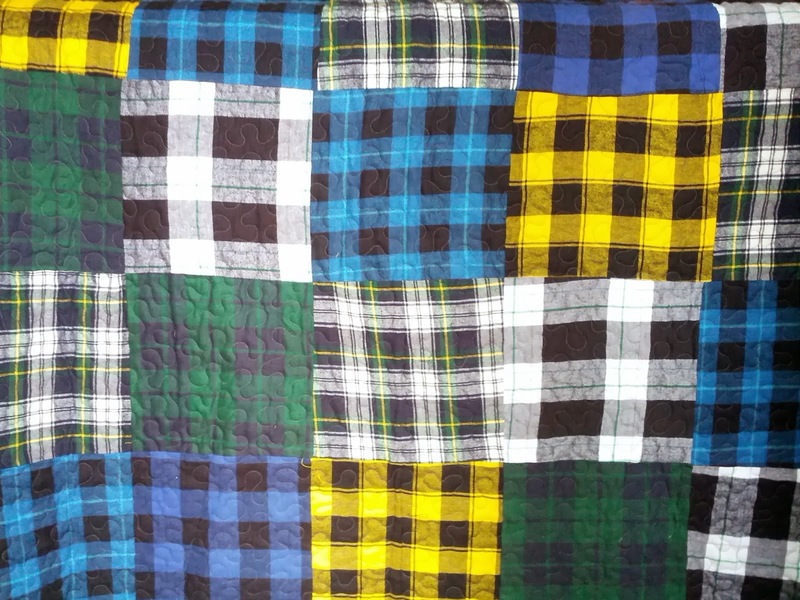 My goal was that this quilt look like it was made from old flannel shirts. I would have actually used old flannel shirts, but didn't have any, and it only occurred to me just now, as I type, that I could have found some at thrift stores for cheaper than what it costs to buy fabric. 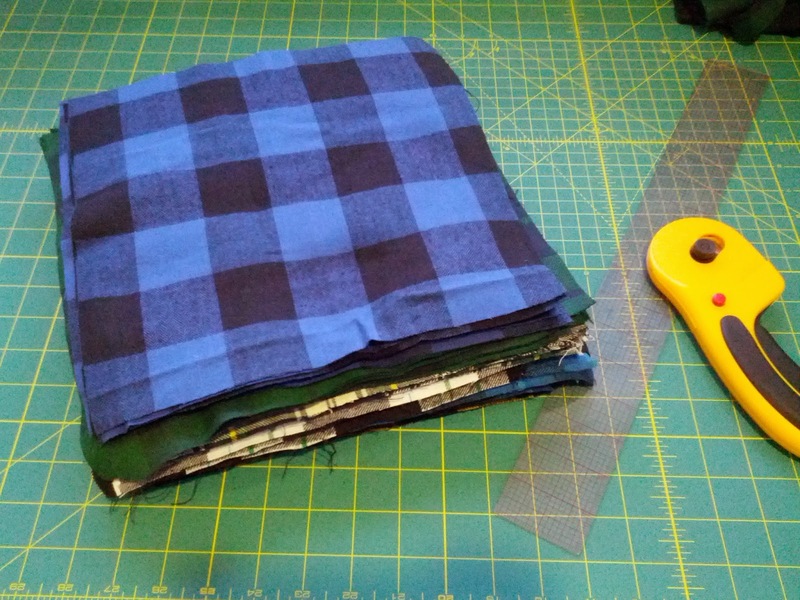 I roughly cut ten-inch squares out of all of the fabric using a rotary board and cutter. As I said before, I did not precisely measure, so some of the squares vary up to half an inch. As precise as a craft as they seem to be, quilts can actually be very forgiving of little mistakes. 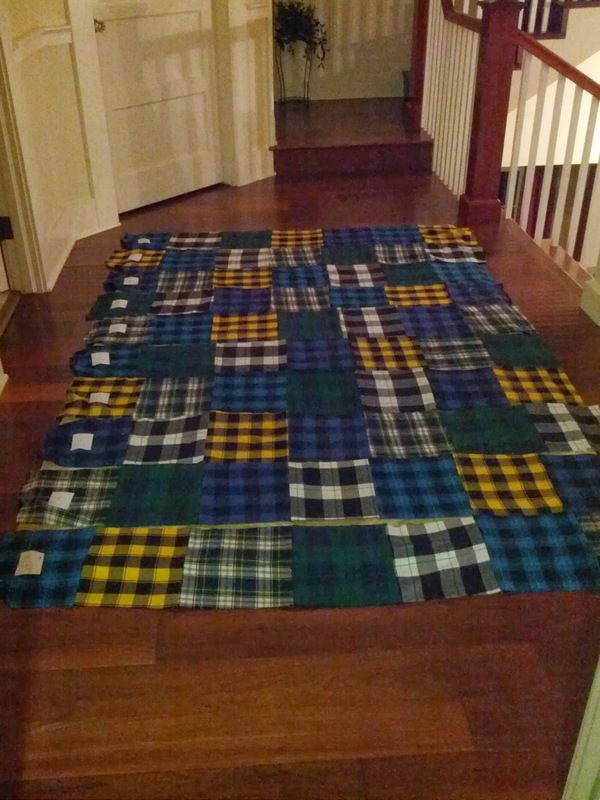 I laid out the squares in the size I wanted, about nine rows by six rows. Patchwork quilts are really easy, because all you have to do is sew squares into rows, and then rows into one big face. I did the whole face of the quilt, cutting and all, in one night while visiting my parents. A friend of mine has a quilting machine, and she stippled it for me in just a few days. This is the batting I used, and the backing was just six yards of grey shirting fabric. The night I got it back, I cut out the fabric for the binding (this did actually require some measuring, but it was pretty quick). The next day, I ironed it, sewed it on one side with the machine, and finished the binding by hand. Yep. All in one day. Just in time for Stormaggedon, too. We snuggled up and watched some House of Cards and listened to the rain under what I'm sure is the softest, coziest quilt ever. Perfect for little boys. This is Project 5 in my 25 Projects challenge. I am attempting to complete 25 projects this year. Contact me if you are interested in sponsoring one of the projects or featuring an item on the blog Craft supplies, handmade items, and home decor are encouraged.